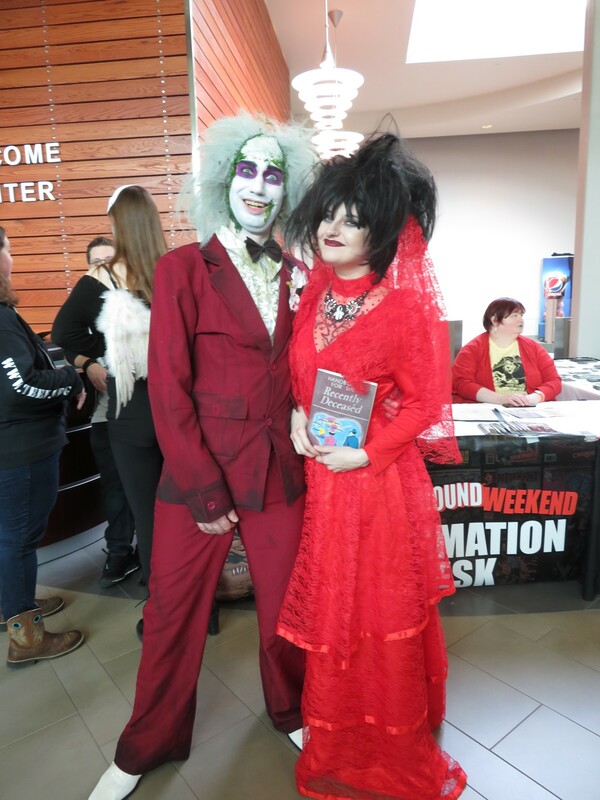 Our HorrorHound Cincinnati 2019 Last-Minute Photo Parade « Midlife Crisis Crossover! This year posed a challenge for us. We were on the fence about attending until a few weeks before showtime, when they added a guest I considered Absolute Must-See. Unfortunately by the time we were prepared to pull the trigger, Saturday passes were sold out. I can’t remember the last time a con ticket sellout threatened to be a major deterrent for us. Not all guests would be there Friday. The only way to make it work was to attend Sunday, which is a thing we nearly never do. Our Sunday morning was spoken for and tightened our time frame to an uncomfortable degree. The earliest we could leave town was 11 a.m. Cincinnati is a mere two hours away — a bit less if you drive like I do, and if no fools stand in my way — but if we ran afoul of massive road construction or accidents, or if we encountered a heavy snowstorm as we did last year, we were doomed. My heart sank when I woke up Sunday morning to large snowflakes cascading everywhere. Funny thing: none of them stuck the roads. By 11 they were all melted, we were off and running. With no accidents ahead and a shockingly zero construction sites in progress, we made it to the Sharonville Convention Center around 12:45. The con closed at 5. We had slightly over four hours to check off our entire to-do list. After paying for parking next door (unlike other late arrivals doing laps and laps and laps around the convention center’s packed spaces) and picking up our wristbands, we made a beeline to the opposite end of the building for the Absolute Must-See actor: Lance Reddick, once known as Lieutenant Daniels from The Wire. You might also remember him as head Agent Phillip Broyles from the Fox SF series Fringe and as the concierge at the Continental from the John Wick series, soon to be a trilogy. We couldn’t hear each other very well over some other actor’s crowd behind us, but the moment was treasured nonetheless. Among other subjects, we discussed how the lessons of The Wire still apply today to a lot of large American cities including our own Indianapolis hometown, and how David Simon’s original nonfiction book Homicide: A Year on the Killing Streets is like a War and Peace for our generation — thick and complex and with an enormous cast, but deeply affecting, essential reading. Anne cheerfully found a guest of her own to greet. Most folks recognize Carel Struycken as Lurch from the Addams Family movies. Anne also remembers him from several episodes of Star Trek: The Next Generation as the quiet Mr. Homn, assistant to Deanna Troi’s mom Lwaxana Troi. 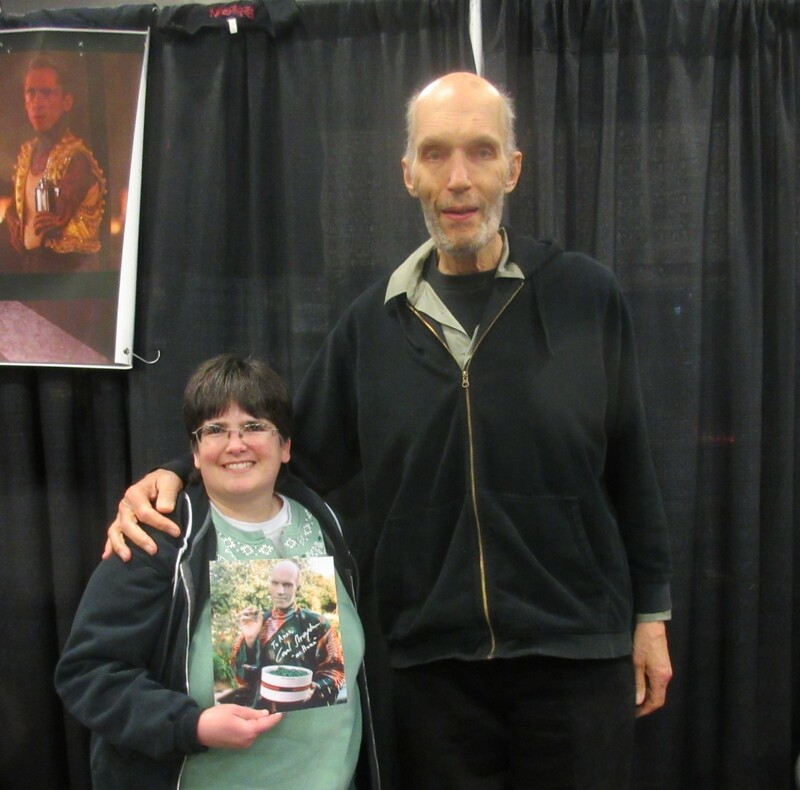 Fun trivia: Carel Struycken is nearly two Annes tall. Our next guest required a scavenger hunt. 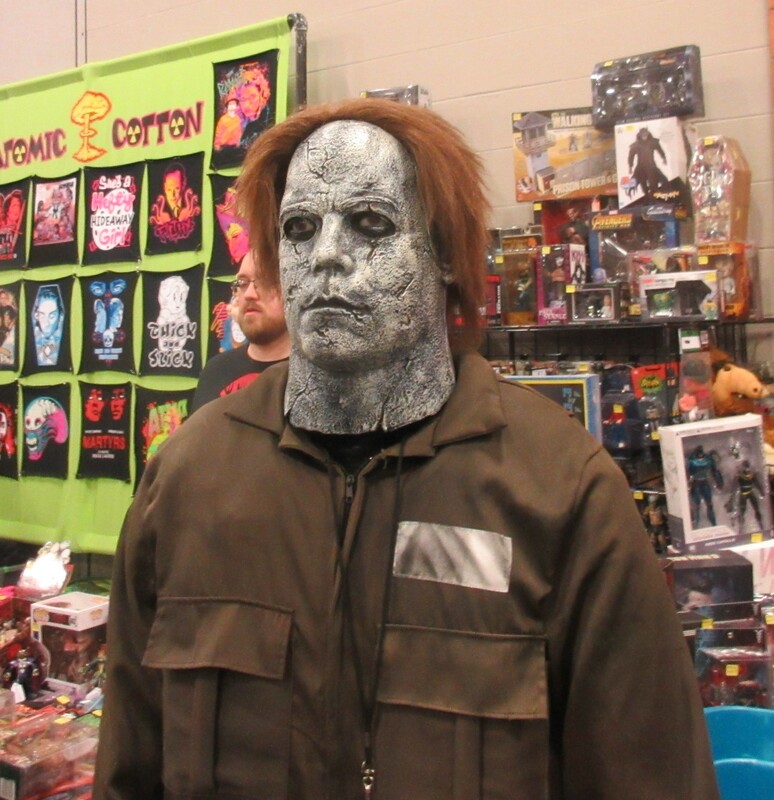 HorrorHound Cincinnati’s guests were spread out across three exhibit halls. 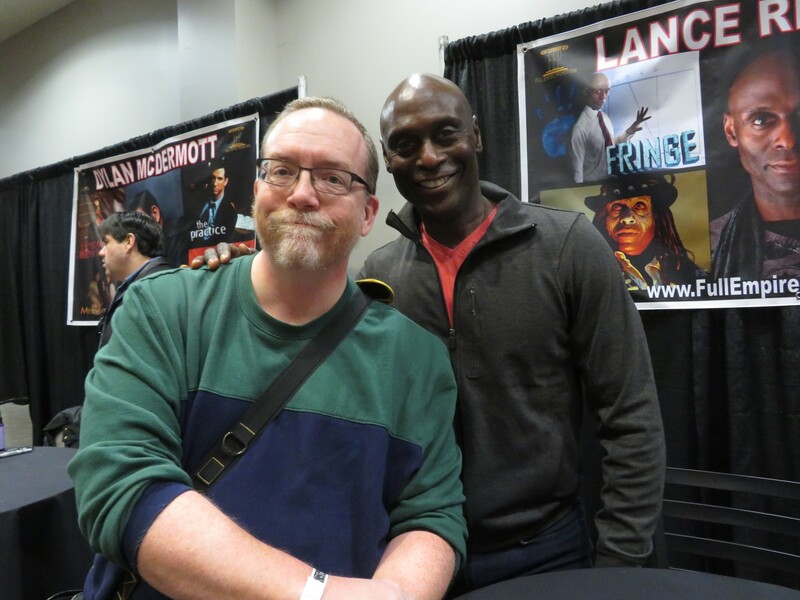 Lance Reddick and the highest-profile guests were in Hall C. Mr. Struycken and assorted other actors at various points in their careers were in Halls A and B. The show floor map alleged our next guy was in Hall A. We searched up and down and saw him nowhere. We tried the information desk. Volunteer 1 deferred to Volunteer 2, who pointed us to Volunteer 3, who graciously walked with us into Hall A to help search, partly because he was curious too. We hadn’t been the first fans to come asking. Volunteer 3 talked to the right folks and learned we needed to go back to Hall C, ignore all the guests who had visible banners and long lines, and look for a small, unassuming table in a dark corner away from convenient pathways, basic visibility, and human contact. 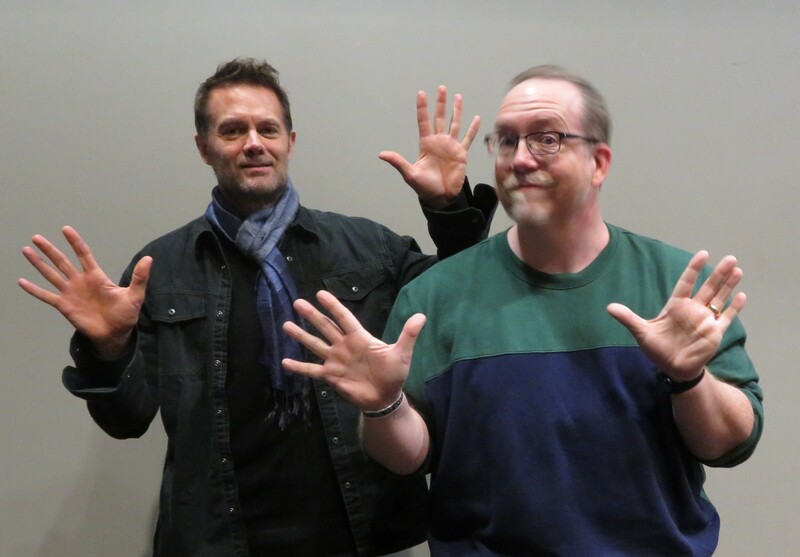 He didn’t word it like that, but that’s where we found Garret Dillahunt. His performance as a reprogrammed Terminator in The Sarah Conner Chronicles was among that show’s many, many unappreciated highlights. I’ve also seen him in season 1 of The Gifted, the one episode of the sitcom Raising Hope I ever watched, and such films as The Road, 12 Years a Slave, Looper, and Winter’s Bone. if The Sarah Conner Chronicles had lived on, I could totally imagine Cromartie doing jazz hands. Extremely nice gentleman, but if I were an actor of any size and convention showrunners had tucked me into a distant corner like that with absolutely no way for fans to find me except by mounting an exploratory expedition, I’d be severely ticked. Our final actor of the weekend may have the most familiar face of all. 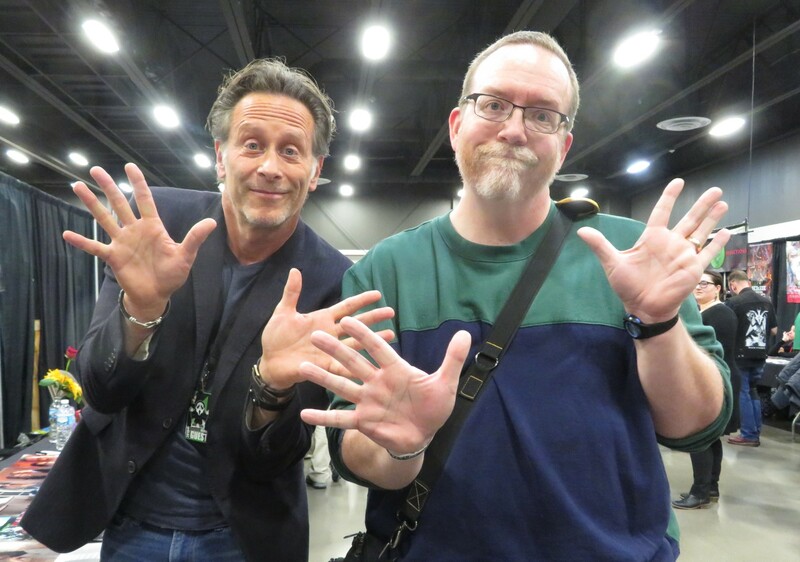 Steven Weber has been all over TV throughout the past two decades, from the NBC sitcom Wings and onward to parts of varying sizes in Studio 60 and Falling Skies, one episode apiece of Community and Sleepy Hollow (which I recapped at the time!) and the starring role of Jack Torrance in the 6-hour miniseries version of The Shining, which hewed more closely to Stephen King’s book than Kubrick’s classic artiness and Jack Nicholson’s over-the-top Nicholsonality did. Weber was deep in chat with next-door table-neighbor Annabeth Gish when we approached. I hated to interrupt and cheerfully let them go on for a bit. 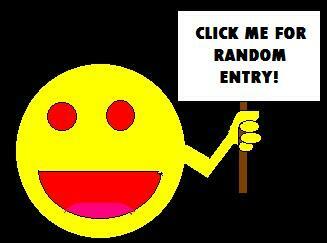 Actors like to have fun at these events too, and it’s a shame when they pause on my account. I considered asking if it bugged him that his last name was misspelled on every single piece of HHC literature, but enjoyed the moment instead. We did our dutiful tour of the vendors and artists and whatnot, but bought very little because (a) we’re not into accumulating as much stuff as we used to be, and (b) we have another con coming up extremely soon that more accurately caters to my accumulation desires. We did make a point of saying hi to author Mike West, a HorrorHound regular we’ve met at past shows, among other places. 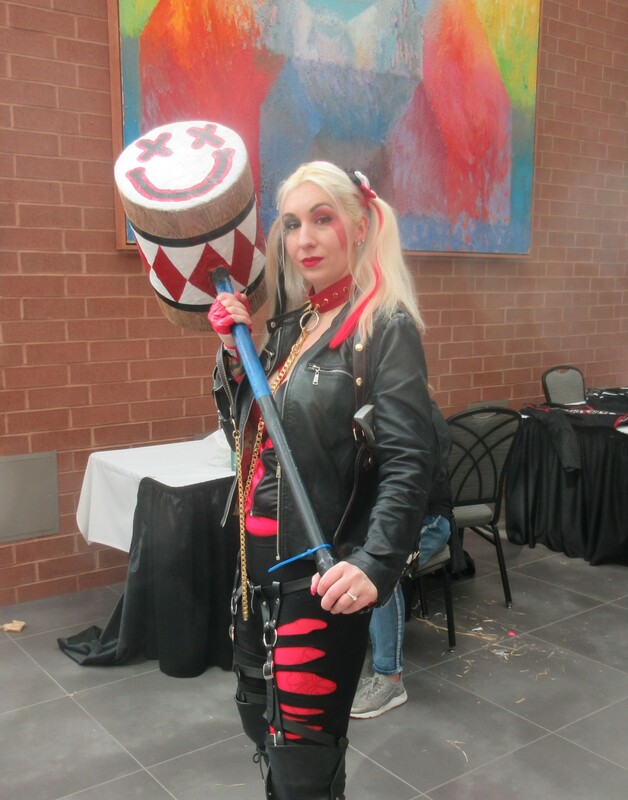 Even though it was Sunday and full-weekend attendees were probably exhausted and ready to nap wherever they stood, cosplayers nonetheless abounded, raising spirits and property values with their imagination and craftsmanship. 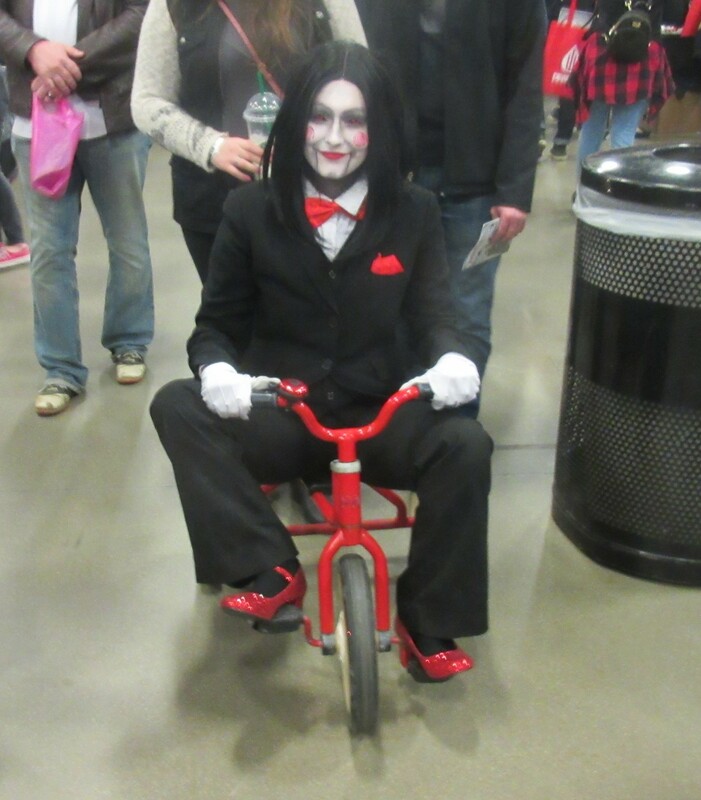 Billy the Puppet from Saw, complete with tricycle with a li’l bell on it. 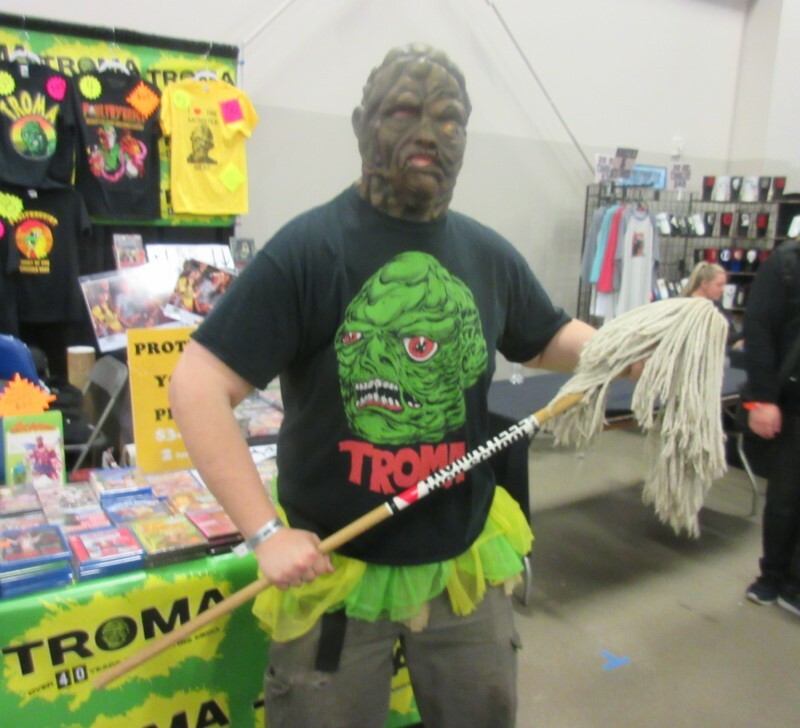 The Toxic Avenger, plying his wares at the Troma Films booth. Beetlejuice and Lydia in their wedding attire. A demon lady whose name I wish I knew, whose wings even worked. By which I mean they folded and unfolded, not that she literally flew. At least, not in front of us. 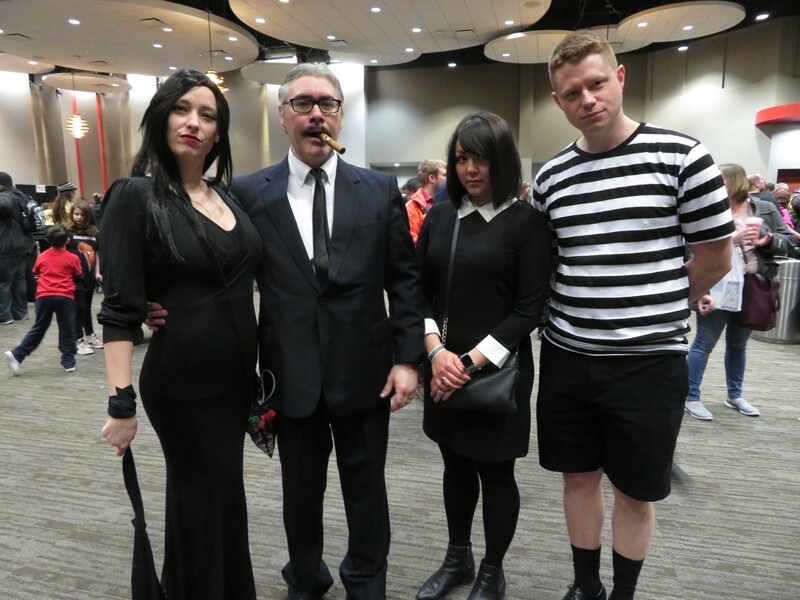 Morticia, Gomez, Wednesday and Pugsley Addams, keeping it in the Family. I suspected this might take hours. It didn’t, for one simple reason: none of these guests had a line. At all. I like to think they spent all day Saturday overwhelmed with thousands of teeming followers descending upon them for attention and selfies, and by Sunday afternoon everyone was just too tired to move and/or thought the actors could use a breather. Whatever the reason, we wrapped up our day to our total satisfaction by 2:00 sharp, 75 minutes spent in all. There were no other panels, no other shopping needs, and not much of our modest budget left. 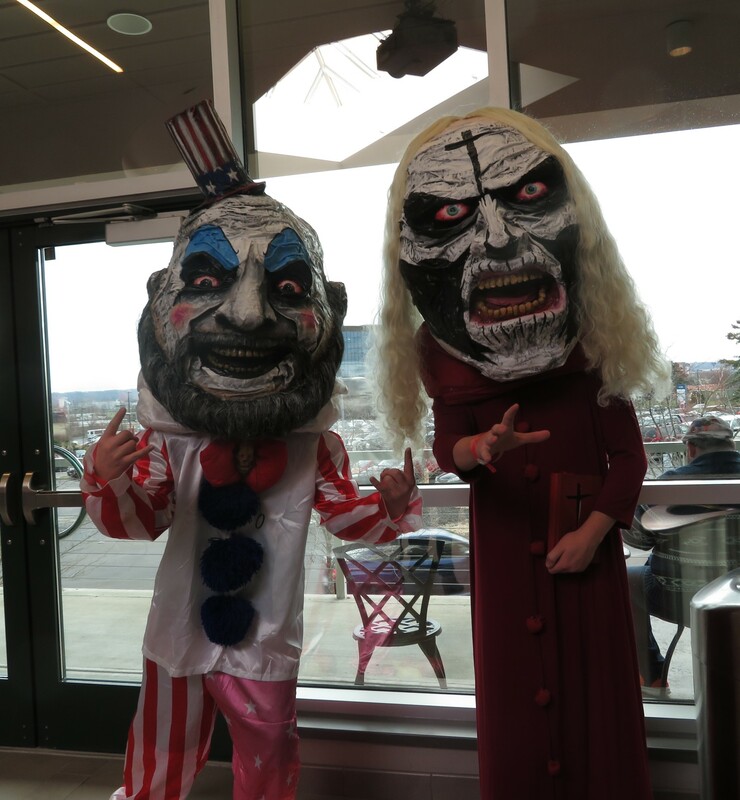 In all: once again HorrorHound Cincinnati was a super fun experience. We’ll see where fates and moods take us next year, and we’ll see readers again in our next set of con photos, which won’t be a long wait. Hi! 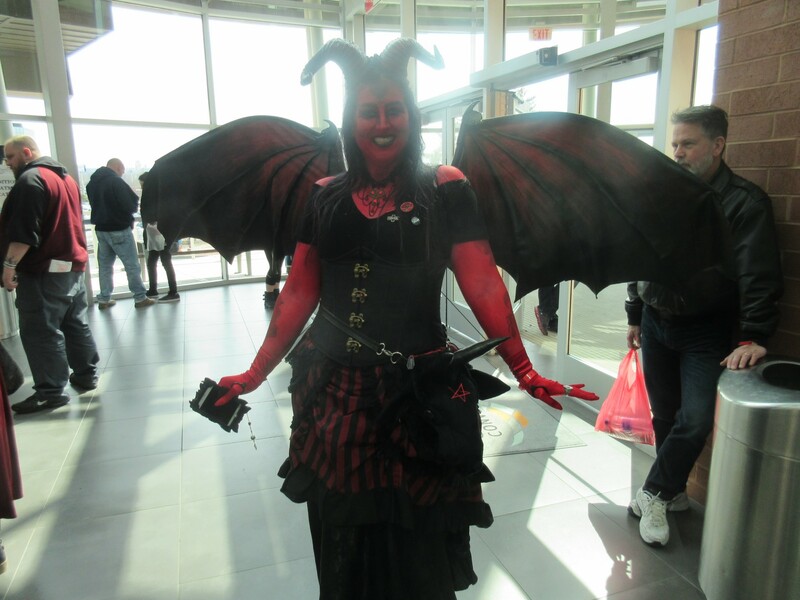 I’m the demon lady with the wings! Thank you!